OSHA 1910 Window Washing Anchor Certification | Peak Fall Protection, Inc. 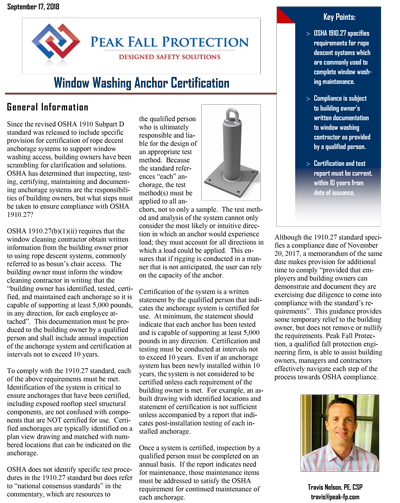 Since the revised OSHA 1910 Subpart D standard was released to include specific provision for certification of rope decent anchorage systems to support window washing access, building owners have been scrambling for clarification and solutions. OSHA has determined that inspecting, testing, certifying, maintaining and documenting anchorage systems are the responsibilities of building owners, but what steps must be taken to ensure compliance with OSHA 1910.27? OSHA 1910.27(b)(1)(ii) requires that the window cleaning contractor obtain written information from the building owner prior to using rope descent systems, commonly referred to as bosun’s chair access. The building owner must inform the window cleaning contractor in writing that the “building owner has identified, tested, certified, and maintained each anchorage so it is capable of supporting at least 5,000 pounds, in any direction, for each employee attached”. This documentation must be produced to the building owner by a qualified person and shall include annual inspection of the anchorage system and certification at intervals not to exceed 10 years. To comply with the 1910.27 standard, each of the above requirements must be met. Identification of the system is critical to ensure anchorages that have been certified, including exposed rooftop steel structural components, are not confused with components that are NOT certified for use. Certified anchorages are typically identified on a plan view drawing and matched with numbered locations that can be indicated on the anchorage. OSHA does not identify specific test procedures in the 1910.27 standard but does refer to “national consensus standards” in the commentary, which are resources to the qualified person who is ultimately responsible and liable for the design of an appropriate test method. Because the standard references “each” anchorage, the test method(s) must be applied to all anchors, not to only a sample. The test method and analysis of the system cannot only consider the most likely or intuitive direction in which an anchor would experience load; they must account for all directions in which a load could be applied. This ensures that if rigging is conducted in a manner that is not anticipated, the user can rely on the capacity of the anchor. Certification of the system is a written statement by the qualified person that indicates the anchorage system is certified for use. At minimum, the statement should indicate that each anchor has been tested and is capable of supporting at least 5,000 pounds in any direction. Certification and testing must be conducted at intervals not to exceed 10 years. Even if an anchorage system has been newly installed within 10 years, the system is not considered to be certified unless each requirement of the building owner is met. For example, an as built drawing with identified locations and statement of certification is not sufficient unless accompanied by a report that indicates post-installation testing of each installed anchorage. Once a system is certified, inspection by a qualified person must be completed on an annual basis. If the report indicates need for maintenance, those maintenance items must be addressed to satisfy the OSHA requirement for continued maintenance of each anchorage. Although the 1910.27 standard specifies a compliance date of November 20, 2017, a memorandum of the same date makes provision for additional time to comply “provided that employers and building owners can demonstrate and document they are exercising due diligence to come into compliance with the standard’s requirements”. This guidance provides some temporary relief to the building owner, but does not remove or nullify the requirements. Peak Fall Protection, a qualified fall protection engineering firm, is able to assist building owners, managers and contractors effectively navigate each step of the process towards OSHA compliance.